Officers with the Marlborough (NH) Police Department left a sign with a message for the grower of 25 illegal marijuana plants. "Sorry about your luck. Plants may be claimed, in person, at the Marlborough Police Department. Please bring your photo ID." Image courtesy of Marlborough PD / Facebook. Officers with the Marlborough (NH) Police Department recently seized 25 marijuana plants growing illegally on an individual's property. When they left the area, they also left a sign with a message for the unknown grower. "Sorry about your luck. 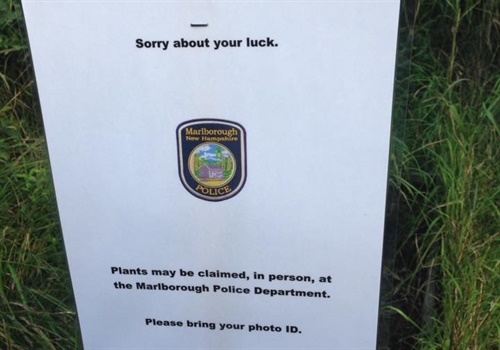 Plants may be claimed, in person, at the Marlborough Police Department. Please bring your photo ID." The department said on its Facebook page, "FACT: Possessing small amounts of marijuana has been decriminalized in NH," adding, "FACT: This doesn’t mean you can grow 25 marijuana plants on someone else's property." The post concluded, "FACT: Using your fine-tuned horticultural skills to grow delicious organic tomatoes is much more rewarding and much more legal."